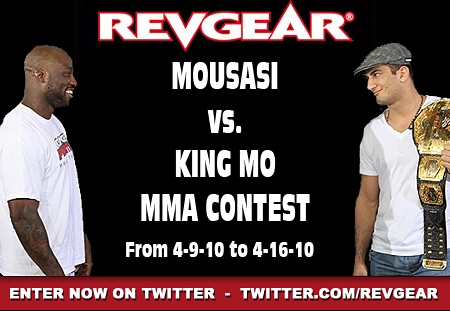 Win a Life-Size Autographed Gegard Mousasi Fighter Standup OR an Autographed Pair of MMA Gloves!In order to win, simply answer the following questions for the upcoming Strikeforce: Nashville fight with contenders Gegard Mousasi vs. King Mo, airing April 17, 2010 on CBS.Answers will only be accepted via Twitter Direct Message - http://twitter.com/revgear - if you don’t have a Twitter account, opening one is quick & easy https://twitter.com/signup Please Direct Message via Twitter to http://twitter.com/revgear and predict the following: 1. Who will win? - Mousasi or King Mo 2. How he’ll win? - KO, TKO, Submission, or Decision 3. What round he’ll win? - 1,2,3,4,5th round This is how your Direct Message should look: YourTwitterUsername: Mousasi, KO, 1st round. Please do not post your answers here! Only answers submitted via Twitter will be considered. We will reply to your Direct Message to acknowledge we received your entry. The winner will be announced on 4-19-10 on Twitter. There will be one (1) winner. The winner with the correct answer will be determined by time stamp of Twitter entry. The prize will be either a life-sized autographed Gegard Mousasi fighter stand-up OR an autographed pair of MMA gloves.